Clarion Co. Pennsylvania. He married Nancy Williams FRAMPTON in 1848. Curtis may have been called Winfield in 1860 census. Roll: M432_767; Page: 19; Image: 40. Source Citation: Year: 1860; Census Place: Monroe, Clarion, Pennsylvania; Roll: M653_1095; Page: 376; Image: 378. Source Citation: Year: 1870; Census Place: Monroe, Clarion, Pennsylvania; Roll: M593_1326; Page: 536; Image: 392. Source Citation: Year: 1880; Census Place: Monroe, Clarion, Pennsylvania; Roll: T9_1117; Family History Film: 1255117; Page: 211.3000; Enumeration District: 73; Image: 0427. Source Citation: Year: 1880; Census Place: Clarion, Clarion, Pennsylvania; Roll: T9_1117; Family History Film: 1255117; Page: 75.2000; Enumeration District: 65; Image: 0155. Source Citation: Year: 1850; Census Place: Washington, Jackson, Ohio; Roll: M432_698; Page: 330; Image: 210.
for the name of "RUTH V. HEDDEN" of Bedford, Texas. in Franklin Co PA, asking about Samuel McConnell ELDER. on the DAR webpage, including the name "FRAMPTON of PA."
hasn't bounced back, so hope she will receive it okay. Will let you know if she replies! James, John, Thomas, William, and Robert. Her father died in January 1835, at Salona, Centre county, and she well remembers John (sic) Morrison, a Presbyterian minister of Buffaloe Valley, Pennsylvania, whom she often heard her Father and Mother speak of as the Minister who joined them in marriage." then to Thomas in Northumberland Co PA.
John Clayton Morrison, far right, was born 7 November 1873 in Wapello County, Iowa and died 24 August 1938 at home in Oskaloosa, Mahaska County, Iowa. His ancestors have been traced to Ireland in the early 1800's. From there they went to Pennsylvania, then Iowa in 1854. John married Florence Belle Elder, to the left of John, 10 December 1902 in Florence's father's residence Marion Township, Davis County, Iowa. Florence was born 22 June 1882 in Marion Township, Davis County, Iowa and died 1 April 1968 at Mahaska Manor Nursing Home in Oskaloosa, Mahaska County, Iowa. Florence's ancestors have been traced to Pennsylvania in the late 1700's. From there they went to Ohio, then to Wapello County, Iowa circa 1854. Roll: T623 427; Page: 2B; Enumeration District: 8. Enumeration District: 40; Image: 0715. Source Citation: Year: 1870; Census Place: Soap Creek, Davis, Iowa; Roll: M593_386; Page: 167; Image: 336. Roll: M593_386; Page: 167; Image: 336. Roll: M653_328; Page: 110; Image: 295. Roll: M432_670; Page: 163; Image: 328. "John Elder emigrated from Ireland to Virginia in 1804, and thence came with the Darlings to the Walhonding Valley in 1806. After making several other locations, he settled in Jefferson township about 1820. He died on his farm in 1851, now occupied by his son, Cyrus Elder, a little west of Warsaw. He was a full blooded, county Antrim, Presbyterian. He was twice married, and reared a large family, still prominent in the township. During the War of 1812, he spent some months in hauling supplies to the soldiers." ...NOTE: this is information extracted from "Our Family History" by William E. Elder, a manuscript written (I think) in 1909. The earliest record is of a John Elder (1) who emigrated from near Edinborough, Scotland in 1680 to Antrim County, Northern Ireland. He rented land from a Lord Cavenaugh two miles east of a small village named Bellamona. His descendents in Ireland would hold this lease for the next 150 years, until 1830. John (5), born 10/13/1783, married to Margaret Gray 5/29/1804, emigrated to US the next day. More on John (5) below. 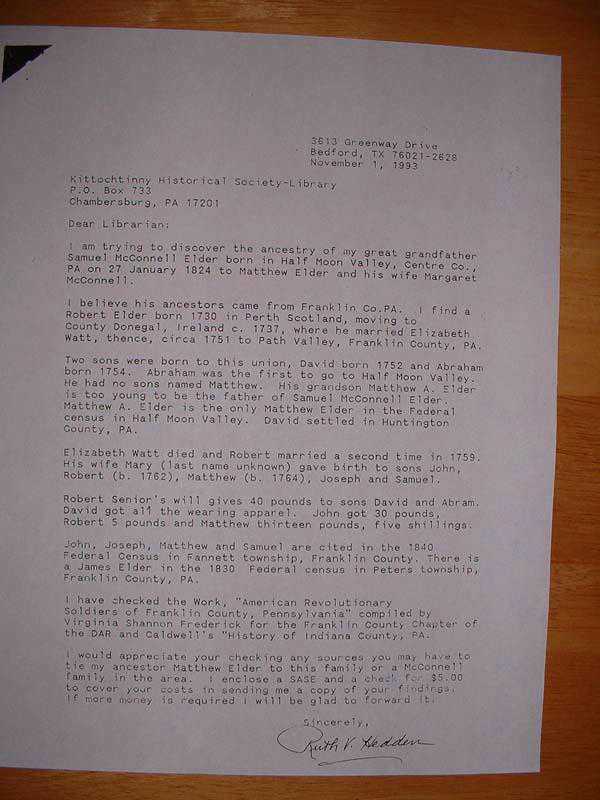 Continuing with the story of John (5) and Margaret Gray Elder, they landed in Baltimore in August 1804, lived there one year, then moved to Coshocton County, Ohio, near Warsaw on the Walhonding River. John (5) stayed there until 1851, when he moved briefly to Monroe County, Iowa , to be nearer his children, buying land at what is now Avery, Ohio. Not liking the prairie, he moved back to the old homestead in Coshocton County and died there, 1/21/1852. Mathew, born 1780, emigrated 1806 to western Pennsylvania, ran a large woolen mill at Elder's Mills, PA. When John (4) emigrated in 1830, he came to live with his son Mathew at Elder's Mills, PA. John (4) died in 1835 and was buried in Darlington, Beaver Co., PA. Mathew had two sons, John R. who moved to Cuba, Missouri and Thomas, who stayed in Darlington, plus an unspecified number of daughters. # Given Name: John (V) G.
Roll: M432_698; Page: 330; Image: 210. 68. Alexander Johnson Elder, born June 20, 1828 in Jackson County, Ohio; died January 02, 1905 in Davis County, Iowa. He was the son of 136. Robert Elder, Jr. and 137. Rachel McKinnis. 69. Marcia Jane Baker August 17, 1850 in Jackson County, Ohio. According to the 1860 Federal census Alexander, age 33, was a farmer with no real estate value listed and $100 personal estate value listed. This census shows the family residing in Polk Township, Jefferson County, Iowa. It also lists Clarrissa as age 7 months and born in Ohio, thus the Alexander Elder family must have moved to Iowa in late 1859 / early 1860. According to the 1870 Federal census Alexander, age 42, rented a farm in Soap Creek Township, Davis County, Iowa. His personal estate was valued at $500. This census also reports that Alexander could not write. The 1885 State census states that Alexander could read, but not write. This same census also lists Lucia Baker and Thomas Good, laborer, living in the Alexander Elder household. Lucia is Alexander's mother-in-law, which would say that her husband Benjamin was dead at this time. Note that their third child was named Benjamin Baker Elder, after his grandfather. Alexander and Marcia are buried in Breeding Cemetery, Marion Township, Davis County, IA. Mother: Mary A. Dempsey b: 28 JUN 1775 in Buffalo Twp., Northumberland Cty., PA. Marriage 1 Mary A. Dempsey b: 28 JUN 1775 in Buffalo Twp., Northumberland Cty., PA.